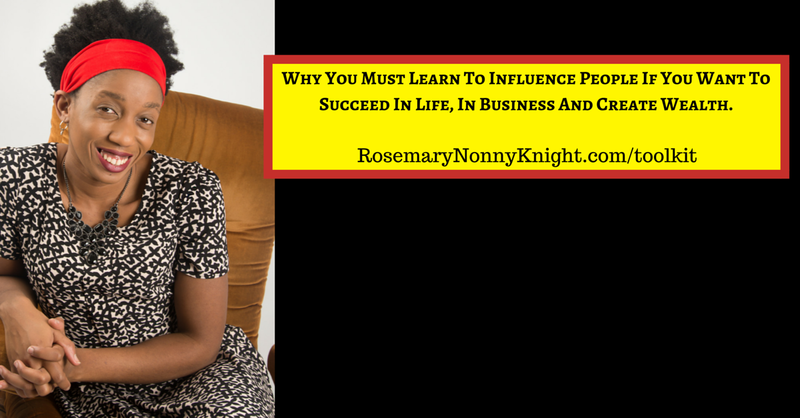 Why You Must Learn To Influence People If You Want To Succeed In Life, In Business And Create Wealth. So, you read the title and your walls went up. “I can’t influence people. That would be wrong. I don’t want to be someone who manipulates people to do what I want them to do. Isn’t that how Hitler got people killed? “ And so on and so forth goes the reel in your mind. And then you switch around to thinking that I am evil and I must be one of those master manipulators that tries to get people to do things they do not want to do. If you do not learn how to influence people, you are going to be pretty broke! If you do not learn to influence then you will not make a difference to anyone! All your good intentions will go nowhere and no one will be impacted by you or your gifts. Give up now on your business and go get a job where you do not have to speak with anyone. Stop parenting as well while you are at it because you can shout until the cows come home but you will fare better if you can influence your children to go in the best direction for them. Shouting only works until they realize they can shout back! And anyway, as you think it is so wrong to influence people – What gives you the right to determine the right way for your kids? Oh, you know better, do you? Has your knowing better created a life that you are completely happy with? Be honest now! Has it? So what makes you think you know better? Hopefully, you see that I am just trying to get you to think things through instead of place a blanket rule on everything. Of course, you want to influence your children. And whether you like it or not, you have to influence people in all areas of your life. It is the only way to live a smooth, fulfilling life. Even that job you think you want to go get because you are not cut out for influencing people will need you to influence the interviewer to give it to you! There is something I heard once before and I do agree with it. Is the intention to enhance the life of another or is it just to enhance your own? Yes, lots of people make mistakes about this and try to convince others of things that are wrong but hardly anyone does it out of malice. Most people have great intentions at heart. Whatever business you are running, you need people to buy into YOU first, particularly as a solopreneur which is what you most likely are. You may be in network marketing and then you definitely need people to see you as a leader or else they will not join your team. For every business or service that you provide, your people must trust that you provide value or else they will not buy from you. It is that simple. And how do you get that trust? As a leader, you learn to influence people. I know you think it should be as easy as telling them about your product or service and expecting them to see the value of it but it does not work that way. You can try and logic-alize it as much as you like but until you touch the heart of people, they WILL NOT MOVE. They will not buy from you. Yes, they can see that it makes logical sense but something will feel wrong, something will feel off, and you will wonder why no one buys. It is because they have not been inspired to it. Their hearts are not engaged in the process. All they see are the cold, hard facts and they are boring. Someone who is gifted with the power of influence and knows that people will never buy because of the facts and features. They will buy because you have shown them how those facts and features will affect the things that matter most to them and then you have gone even deeper to touch their hidden pains and desires and related those to the product or service on offer. Do you know your ideal person well? Can you speak in the language they hear in their heads? Do you wholeheartedly believe in what you have on offer? Not just because you want to make money from it but because you know it will enhance the life of anyone who partakes of it? If you can honestly answer yes to these questions and most people can’t, then your business will grow. You will create wealth easily and it will not be because you focused solely on the money. It will be because you cared enough for the people to influence them to make the right decision for themselves.